What’s the best new type of apple? According to the judges at this year’s Royal Agricultural Winter Fair it’s Ambrosia apples. In particular, it’s the Ambrosia apples grown at Happy Valley Farm in Summerland, BC. The judges awarded them the Canadian Horticultural Council Trophy for being the Grand Champion of New Varieties. These apples beat out all other new varieties from growers across Canada. As astounded as he was to win, he’s not surprised that Ambrosia was the apple that came out on top. He freely admits that it’s his personal go-to apple fresh off the tree. 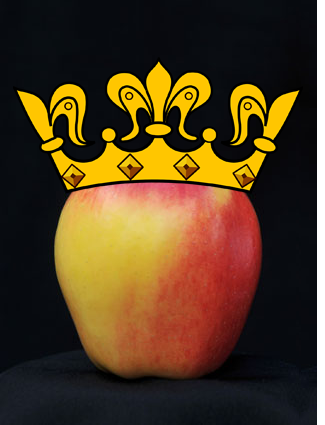 So, the next time you bite into an Ambrosia apple, know that according to the Royal Agriculture Winter Fair judges, you’ve got great taste. Want to see why Steve’s Ambrosia apples are the best? We visited Happy Valley Harvest in 2013 to meet the Brown Family and get a tour of their orchard. Check out that video here.